In this digital world, Smartphone device has been growing at a rapid pace. Around 70% of populations are watching the news in their mobile phones. So it’s right time to start news portal android application business by using our readymade Android News Application and earn high profit from the business. Having an android application will increase the sales of your business and our application is reliable, fast and cost-effective. The user needs to login with the valid username and password to enter into the mobile application. In the home page of the application, the customer can see three tabs such as latest news, topics and saved news. As a default, the visitor can see the latest news in the home screen. There is the search option is to search the news or topics in the title and category based. 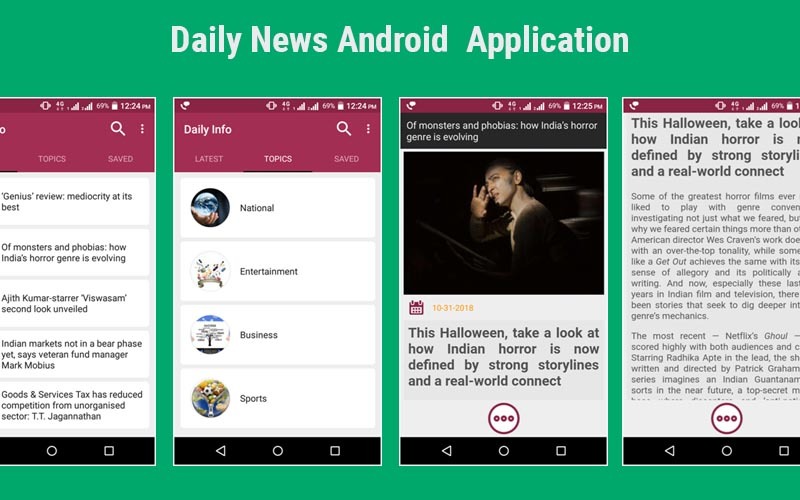 Our Daily News Android Application provides a good experience while reading the news online. In the latest news tab, the user can view the list of news which is posted by the admin in most recent times and also see the title of the news posted and related image for the news. By clicking any news, the visitor will see the full information about the news. In the saved news tab, they can check the list of news which as marked as saved by the user. In the topic tab, the user can see the list of topics or categories which are added by the admin. By clicking any category, they can see the full news list. The visitor can share the news with others by clicking the more icons in the bottom of the page. At the top right corner there is the menu icon which contains about this app, share this app and rate this app option. This News App for Android is developed with Core Java language, so it helps to make the news app run fast and smoothly. The user interface of the application is developed with attractive design and safe code. This android application integrated with admin panel and easy to manage the news, category, images, notification and many more at anytime and anywhere. The main features of this Android News App are user-friendly and powerful admin dashboard, secure login, category and profile management, and many others. Along with the Daily News Android Application, we provide 1-year technical support, 6 month free updates of the source code and we will provide the brand free mobile application to the clients at best price with high features.